Australian Legendary Tales is a collection of Australian folklore gathered by the writer K. Langloh Parker. As a writer in New South Wales, she contributed much to the world about the disappearing Aboriginal tribes. In Australian Legendary Tales, she gathers the stories of the Narran tribe, who refer to themselves as Noongahburrahs. 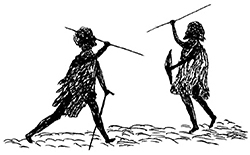 The need to put together such a collection of Aboriginal tales was imminent, as many of the tribe’s elders were dying off. Because she had befriended the Narran, they entrusted her to record their myths and legends. As a thanks for sharing their stories, the author would use the book’s proceeds to purchase items as gifts for the tribe. Illustration by Tommy Mcrae from the book Australian Legendary Tales, 1896. David Nutt, a publisher of children’s folklore, saw the value of these Australian children’s tales, and published Australian Legendary Tales in 1896, and the story collection featured a foreword by the noted folklorist Andrew Lang, famous for his fairy tale collections. Australian Legendary Tales sold remarkably well, and a second volume, More Australian Legendary Tales, was published in 1898. Her husband, Langloh Parker, died in Sydney in 1903 and she moved to Adelaide after marrying Randolph Stow. She left behind many accounts of her outback life, including My Bush Book. Her real name was Catherine, however, she always went by Katie or K.